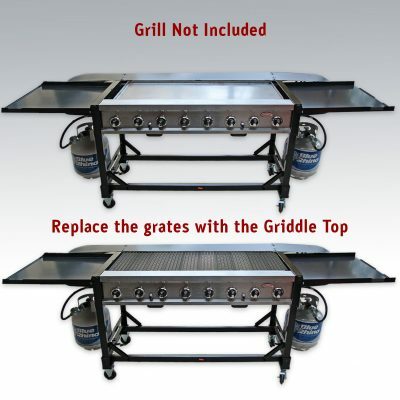 Convert “ANY” regular BBQ or Commercial Kitchen grill to a Reinforced Griddle Master Griddle Top | Teppanyaki Grill Top | Griddle Top Plate | Custom BBQ Griddle Top | Outdoor Griddle | Barbecue Griddle. By simply taking out the BBQ grates, you can turn your old BBQ into an amazing Teppanyaki Grill Top | Griddle Top Plate | Custom BBQ Griddle Top | Outdoor Griddle | Barbecue Griddle. Our Custom Teppanyaki Grill Top maximizes your outdoor cooking experience. Why BBQ on grates where food and juices fall through? 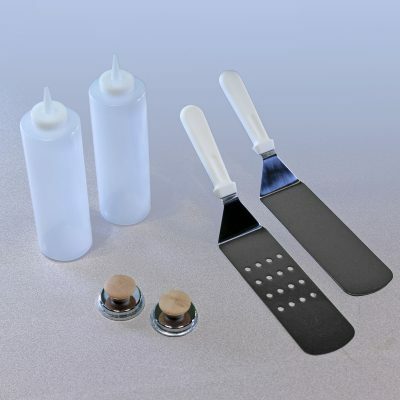 Now you will have two options when you use your BBQ, grill or griddle. 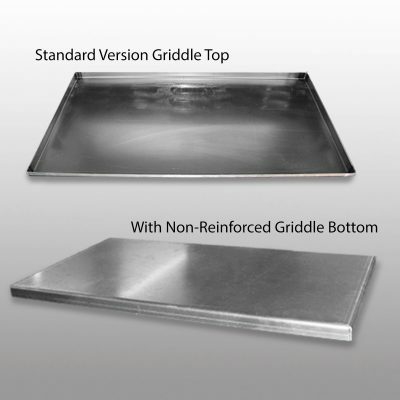 This version of Our Griddle Master Griddle Top is different than others on the market. Our Griddle Top is custom made with 5 additional bars of reinforced steel welded to the bottom for maximum support while allowing it to still fit your BBQ grill. The Custom Teppanyaki Grill Top will easily fit in place of your grates, allowing the griddle to distribute the heat faster and more evenly. 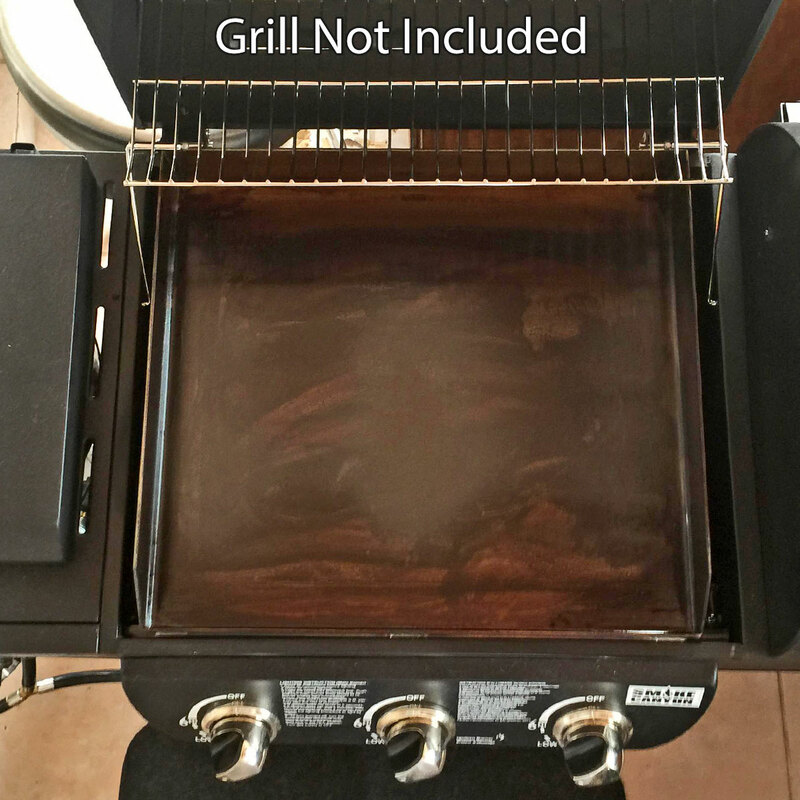 All you need to do is measure the inside *dimensions of your current grill and we will send a perfect fitting griddle replacement right to your front door. 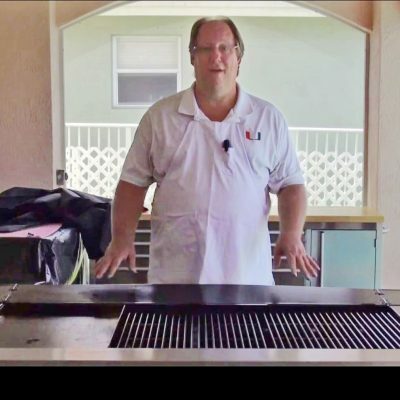 Our Custom BBQ Teppanyaki Grill Tops are made in the U.S.A., so you can expect a quality product. Entertain your friends and family like a pro. Kick off your next backyard barbecue with an outdoor Custom Griddle Master BBQ Teppanyaki Grill Top. 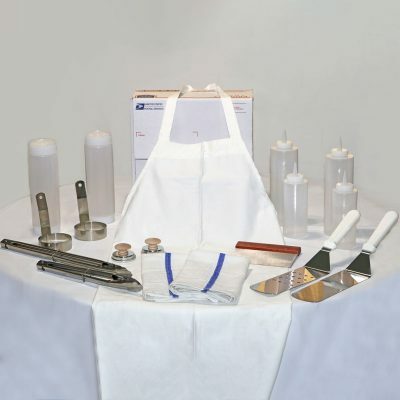 It is the perfect accessory for your BBQ and outdoor entertaining. 3/4 "1 "1 1/2 "2 "2 1/2 "3 "
Please check the area around your grill for a 3" lip. 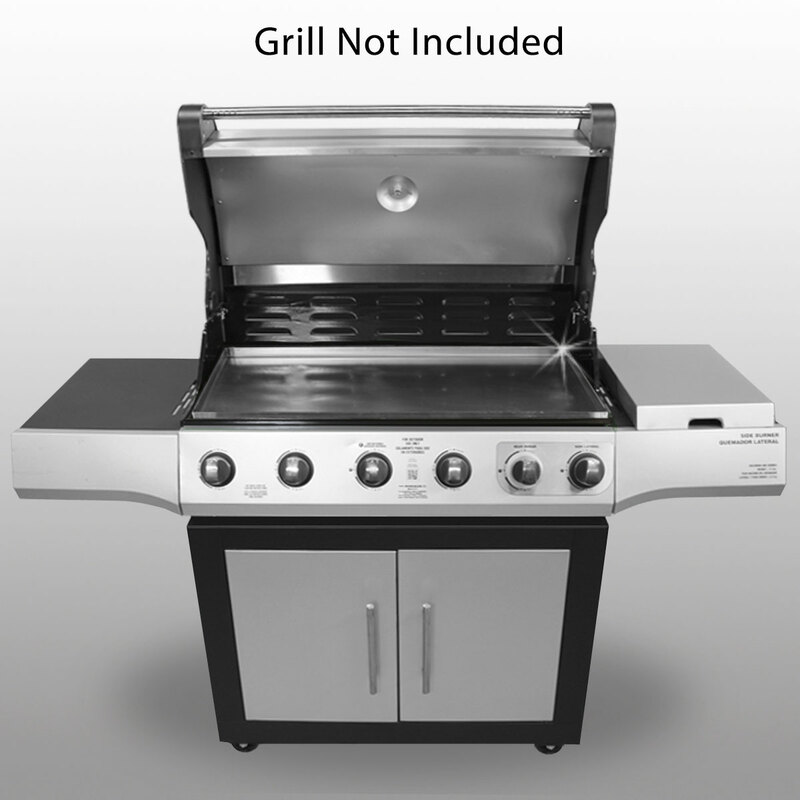 Grills that have a rotisserie should go with a 1" lip because of the gas element in the back of the grill. For most Griddles, 3" is best if it will fit without any problems. It will taper to a 1" front. The lip is the height of the bend / Lip that will be put on your griddle. 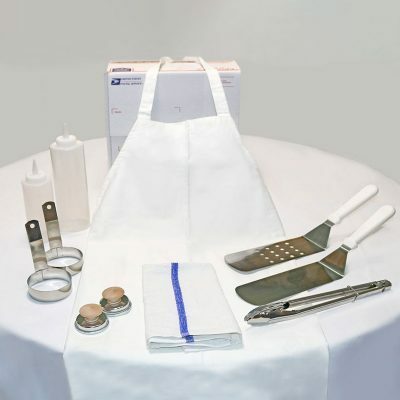 This is just to keep the food & liquid from falling off as well act as support. 8 "8 1/8 "8 1/4 "8 3/8 "8 1/2 "8 5/8 "8 3/4 "8 7/8 "9 "9 1/8 "9 1/4 "9 3/8 "9 1/2 "9 5/8 "9 3/4 "9 7/8 "10 "10 1/8 "10 1/4 "10 3/8 "10 1/2 "10 5/8 "10 3/4 "10 7/8 "11 "11 1/8 "11 1/4 "11 3/8 "11 1/2 "11 5/8 "11 3/4 "11 7/8 "12 "12 1/8 "12 1/4 "12 3/8 "12 1/2 "12 5/8 "12 3/4 "12 7/8 "13 "13 1/8 "13 1/4 "13 3/8 "13 1/2 "13 5/8 "13 3/4 "13 7/8 "14 "14 1/8 "14 1/4 "14 3/8 "14 1/2 "14 5/8 "14 3/4 "14 7/8 "15 "15 1/8 "15 1/4 "15 3/8 "15 1/2 "15 5/8 "15 3/4 "15 7/8 "16 "16 1/8 "16 1/4 "16 3/8 "16 1/2 "16 5/8 "16 3/4 "16 7/8 "17 "17 1/8 "17 1/4 "17 3/8 "17 1/2 "17 5/8 "17 3/4 "17 7/8 "18 "18 1/8 "18 1/4 "18 3/8 "18 1/2 "18 5/8 "18 3/4 "18 7/8 "19 "19 1/8 "19 1/4 "19 3/8 "19 1/2 "19 5/8 "19 3/4 "19 7/8 "20 "20 1/8 "20 1/4 "20 3/8 "20 1/2 "20 5/8 "20 3/4 "20 7/8 "21 "21 1/8 "21 1/4 "21 3/8 "21 1/2 "21 5/8 "21 3/4 "21 7/8 "22 "22 1/8 "22 1/4 "22 3/8 "22 1/2 "22 5/8 "22 3/4 "22 7/8 "23 "23 1/8 "23 1/4 "23 3/8 "23 1/2 "23 5/8 "23 3/4 "23 7/8 "24 "24 1/8 "24 1/4 "24 3/8 "24 1/2 "24 5/8 "24 3/4 "24 7/8 "25 "25 1/8 "25 1/4 "25 3/8 "25 1/2 "25 5/8 "25 3/4 "25 7/8 "26 "26 1/8 "26 1/4 "26 3/8 "26 1/2 "26 5/8 "26 3/4 "26 7/8 "27 "27 1/8 "27 1/4 "27 3/8 "27 1/2 "27 5/8 "27 3/4 "27 7/8 "28 "28 1/8 "28 1/4 "28 3/8 "28 1/2 "28 5/8 "28 3/4 "28 7/8 "29 "29 1/8 "29 1/4 "29 3/8 "29 1/2 "29 5/8 "29 3/4 "29 7/8 "30 "30 1/8 "30 1/4 "30 3/8 "30 1/2 "30 5/8 "30 3/4 "30 7/8 "31 "31 1/8 "31 1/4 "31 3/8 "31 1/2 "31 5/8 "31 3/4 "31 7/8 "32 "32 1/8 "32 1/4 "32 3/8 "32 1/2 "32 5/8 "32 3/4 "32 7/8 "33 "33 1/8 "33 1/4 "33 3/8 "33 1/2 "33 5/8 "33 3/4 "33 7/8 "34 "34 1/8 "34 1/4 "34 3/8 "34 1/2 "34 5/8 "34 3/4 "34 7/8 "35 "35 1/8 "35 1/4 "35 3/8 "35 1/2 "35 5/8 "35 3/4 "35 7/8 "36 "36 1/8 "36 1/4 "36 3/8 "36 1/2 "36 5/8 "36 3/4 "36 7/8 "37 "37 1/8 "37 1/4 "37 3/8 "37 1/2 "37 5/8 "37 3/4 "37 7/8 "38 "38 1/8 "38 1/4 "38 3/8 "38 1/2 "38 5/8 "38 3/4 "38 7/8 "39 "39 1/8 "39 1/4 "39 3/8 "39 1/2 "39 5/8 "39 3/4 "39 7/8 "40 "40 1/8 "40 1/4 "40 3/8 "40 1/2 "40 5/8 "40 3/4 "40 7/8 "41 "41 1/8 "41 1/4 "41 3/8 "41 1/2 "41 5/8 "41 3/4 "41 7/8 "42 "42 1/8 "42 1/4 "42 3/8 "42 1/2 "42 5/8 "42 3/4 "42 7/8 "43 "43 1/8 "43 1/4 "43 3/8 "43 1/2 "43 5/8 "43 3/4 "43 7/8 "44 "44 1/8 "44 1/4 "44 3/8 "44 1/2 "44 5/8 "44 3/4 "44 7/8 "45 "45 1/8 "45 1/4 "45 3/8 "45 1/2 "45 5/8 "45 3/4 "45 7/8 "46 "46 1/8 "46 1/4 "46 3/8 "46 1/2 "46 5/8 "46 3/4 "46 7/8 "47 "47 1/8 "47 1/4 "47 3/8 "47 1/2 "47 5/8 "47 3/4 "47 7/8 "48 "48 1/8 "48 1/4 "48 3/8 "48 1/2 "48 5/8 "48 3/4 "48 7/8 "49 "49 1/8 "49 1/4 "49 3/8 "49 1/2 "49 5/8 "49 3/4 "49 7/8 "50 "50 1/8 "50 1/4 "50 3/8 "50 1/2 "50 5/8 "50 3/4 "50 7/8 "51 "51 1/8 "51 1/4 "51 3/8 "51 1/2 "51 5/8 "51 3/4 "51 7/8 "52 "52 1/8 "52 1/4 "52 3/8 "52 1/2 "52 5/8 "52 3/4 "52 7/8 "53 "53 1/8 "53 1/4 "53 3/8 "53 1/2 "53 5/8 "53 3/4 "53 7/8 "54 "54 1/8 "54 1/4 "54 3/8 "54 1/2 "54 5/8 "54 3/4 "54 7/8 "55 "55 1/8 "55 1/4 "55 3/8 "55 1/2 "55 5/8 "55 3/4 "55 7/8 "56 "56 1/8 "56 1/4 "56 3/8 "56 1/2 "56 5/8 "56 3/4 "56 7/8 "57 "57 1/8 "57 1/4 "57 3/8 "57 1/2 "57 5/8 "57 3/4 "57 7/8 "58 "58 1/8 "58 1/4 "58 3/8 "58 1/2 "58 5/8 "58 3/4 "58 7/8 "59 "59 1/8 "59 1/4 "59 3/8 "59 1/2 "59 5/8 "59 3/4 "59 7/8 "60 "
If installing in a gas BBQ, make sure you deduct 3 inches from your total width so you allow 1.5 inches on each side for the heat to escape. 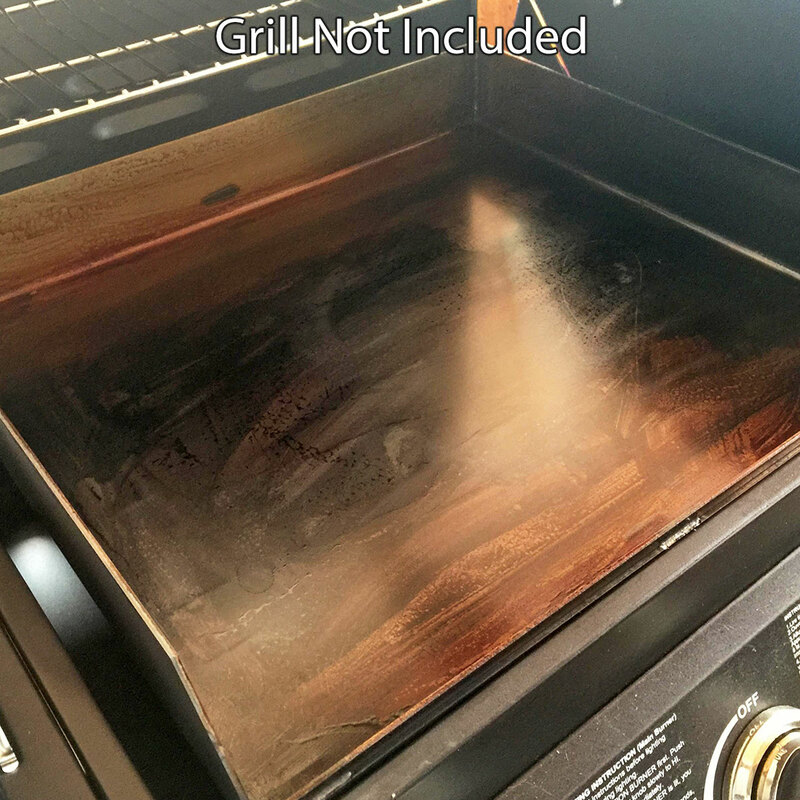 This will prevent the heat from damaging your grill. 12 "12 1/8 "12 1/4 "12 3/8 "12 1/2 "12 5/8 "12 3/4 "12 7/8 "13 "13 1/8 "13 1/4 "13 3/8 "13 1/2 "13 5/8 "13 3/4 "13 7/8 "14 "14 1/8 "14 1/4 "14 3/8 "14 1/2 "14 5/8 "14 3/4 "14 7/8 "15 "15 1/8 "15 1/4 "15 3/8 "15 1/2 "15 5/8 "15 3/4 "15 7/8 "16 "16 1/8 "16 1/4 "16 3/8 "16 1/2 "16 5/8 "16 3/4 "16 7/8 "17 "17 1/8 "17 1/4 "17 3/8 "17 1/2 "17 5/8 "17 3/4 "17 7/8 "18 "18 1/8 "18 1/4 "18 3/8 "18 1/2 "18 5/8 "18 3/4 "18 7/8 "19 "19 1/8 "19 1/4 "19 3/8 "19 1/2 "19 5/8 "19 3/4 "19 7/8 "20 "20 1/8 "20 1/4 "20 3/8 "20 1/2 "20 5/8 "20 3/4 "20 7/8 "21 "21 1/8 "21 1/4 "21 3/8 "21 1/2 "21 5/8 "21 3/4 "21 7/8 "22 "22 1/8 "22 1/4 "22 3/8 "22 1/2 "22 5/8 "22 3/4 "22 7/8 "23 "23 1/8 "23 1/4 "23 3/8 "23 1/2 "23 5/8 "23 3/4 "23 7/8 "24 "24 1/8 "24 1/4 "24 3/8 "24 1/2 "24 5/8 "24 3/4 "24 7/8 "25 "25 1/8 "25 1/4 "25 3/8 "25 1/2 "25 5/8 "25 3/4 "25 7/8 "26 "26 1/8 "26 1/4 "26 3/8 "26 1/2 "26 5/8 "26 3/4 "26 7/8 "27 "27 1/8 "27 1/4 "27 3/8 "27 1/2 "27 5/8 "27 3/4 "27 7/8 "28 "28 1/8 "28 1/4 "28 3/8 "28 1/2 "28 5/8 "28 3/4 "28 7/8 "29 "29 1/8 "29 1/4 "29 3/8 "29 1/2 "29 5/8 "29 3/4 "29 7/8 "30 "30 1/8 "30 1/4 "30 3/8 "30 1/2 "30 5/8 "30 3/4 "30 7/8 "31 "31 1/8 "31 1/4 "31 3/8 "31 1/2 "31 5/8 "31 3/4 "31 7/8 "32 "32 1/8 "32 1/4 "32 3/8 "32 1/2 "32 5/8 "32 3/4 "32 7/8 "33 "33 1/8 "33 1/4 "33 3/8 "33 1/2 "33 5/8 "33 3/4 "33 7/8 "34 "34 1/8 "34 1/4 "34 3/8 "34 1/2 "34 5/8 "34 3/4 "34 7/8 "35 "35 1/8 "35 1/4 "35 3/8 "35 1/2 "35 5/8 "35 3/4 "35 7/8 "36 "
Measure your depth from front to back. Make sure your measurements are correct. Then deduct 1/8 to 1/4 inch to allow room for the griddle to fit. Exact measurements will work but why take a chance. Simply deduct 1/8 inch from your measurement. 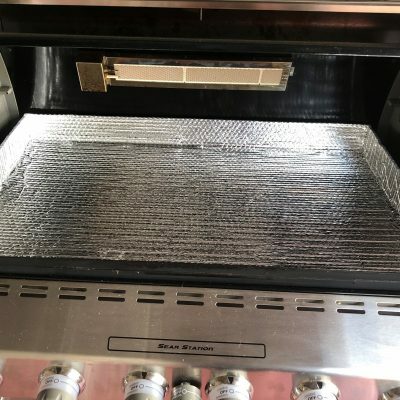 Save time and a trip to the store by letting us apply the High Heat Rustoleum to the bottom of your griddle. That way all you will need to do is season your top when you get it. 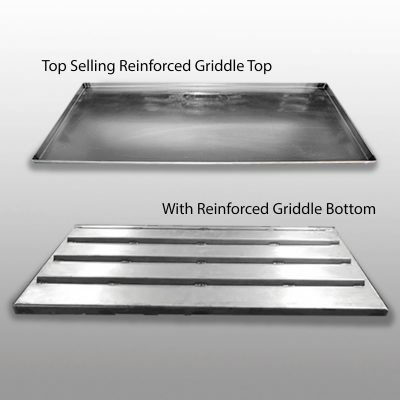 Griddle Masters Reinforced Version custom Griddle Plate made to fit your BBQ Grill. 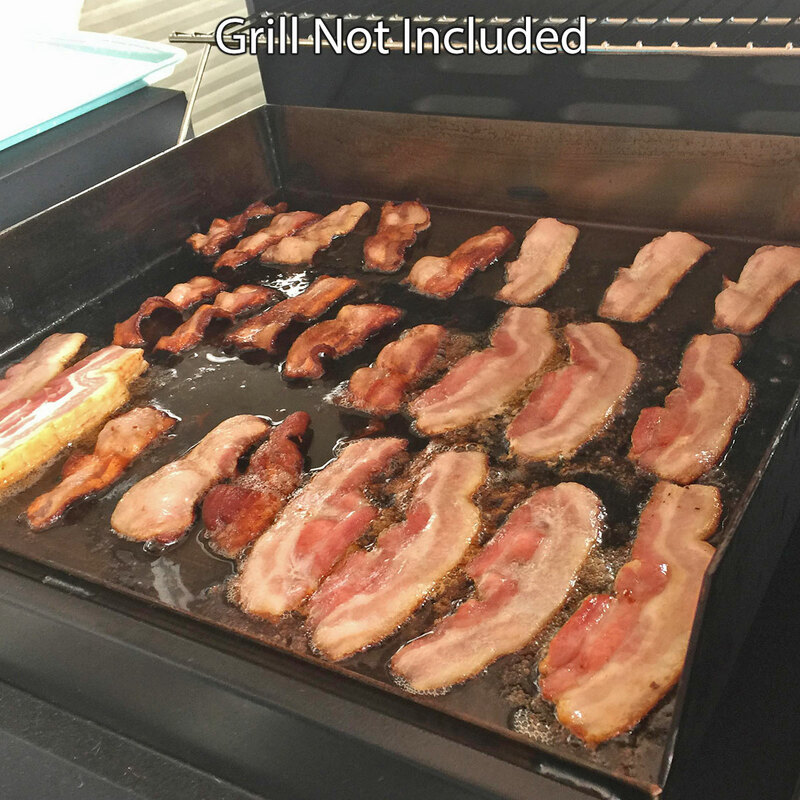 Kick off your backyard barbecue with an outdoor BBQ Griddle Plate. 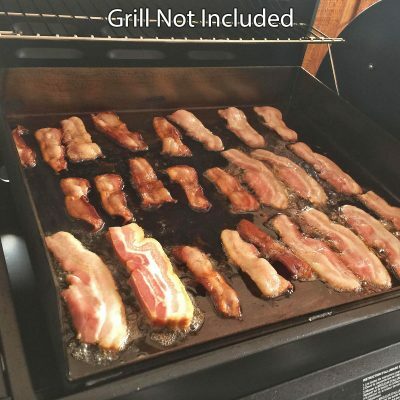 This custom Griddle Plate can be placed in your current BBQ. 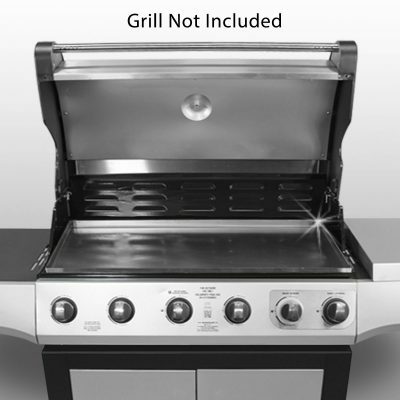 Just remove your current BBQ grates replace with your new Griddle to enhance your outdoor grilling experience. 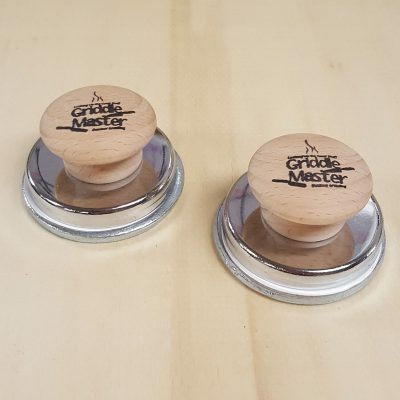 Find not only great recipe’s on Griddle Master.com but watch the video of us making that recipe on one of our griddle tops. See how you can do Biscuits, Soups, Steak, Hamburgers, Chinese Food, Bourbon Chicken, Lasagna, Cheddar bay biscuits from Red Lobster and many more on the griddle! From BBQ grates to griddle Plate. 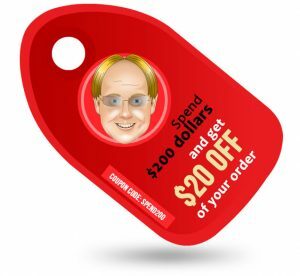 Griddle Master will ship directly to your door a custom griddle made in the United States. All you need to do is go and measure your current grill’s opening. Inside your BBQ, measure the width & depth. Width being from left to right, usually the bigger number. Then the depth being front to back, usually around 19 inches or so. Very important that you are within 1/4 inch when measuring the depth. The width is more forgiving since you will need to deduct 3 inches from the width so the heat has some room to escape. 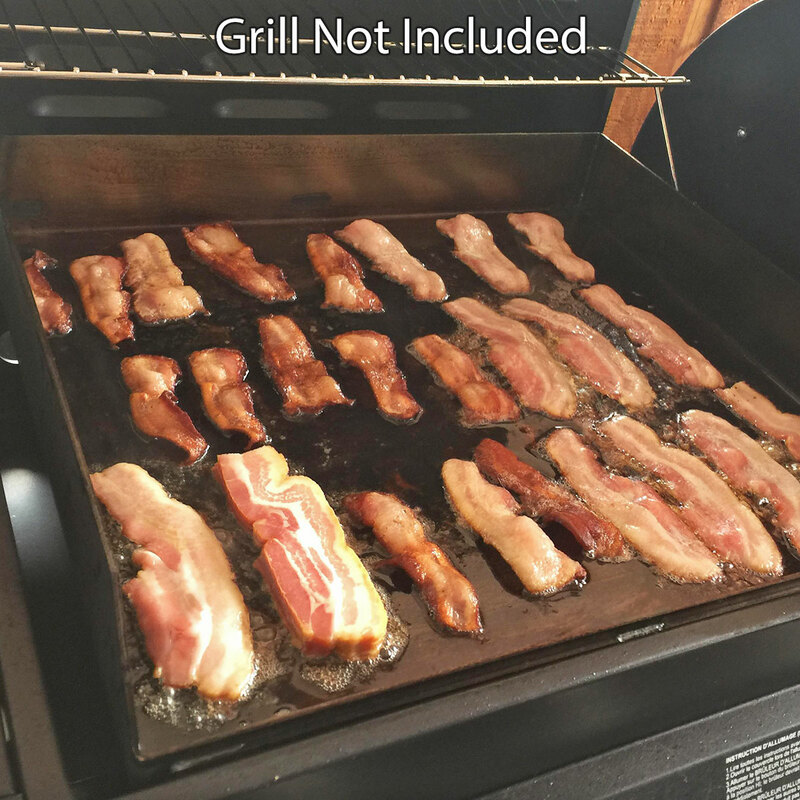 So to recap how to measure the inside of your grill. When measuring the width, measure the inside that the grate rest on from left to right and deduct 3 inches from that number. Write down the width in inches less the 3 inches you are deducting for heat escape room. When measuring the depth, be real careful to not over measure this, just make sure you are measuring straight down from back to front. You may be better off measuring on the far left and verify you measurement by measuring the far right. Remember to measure the inside dimension. Then subtract 1/16 inch just to be sure the griddle coming to you will fit perfectly. See the video on how to measure. Our Griddle Master Griddle Top can even work with these brands: AOG, Alfresco, American Muscle Grill, Backyard Hibachi, Bayou Boiler, Bayou Classic, BeefEater, Bergquist, Blaze Outdoor Products, Broilmaster, Bull, Cajun Cookware, Cal Flame, Caliber Range Corporation, Coleman, Cookshack, Coyote, Crown Verity, Cuisinart, DCS, Distinctive Culinary Concepts, EVO, Fire Magic, FlameKing, Golden Blount, Gourmet Guru, Grill Barrow, Grill Dome, Grill Gauge, GrillPro, Hansen, Hasty-Bake, Hurricane Products, Kamado Joe, Kenyon, KitchenAid, Lion Premium Grills, Louisiana Grills, Luxor, Lynx, MB Sturgis, MCM, MHP, Memphis Grills, Napoleon, Nexgrill, PGS, Paragon Distributing, Patio Comfort, Phoenix, Portable Kitchen, Primo, ProFire, RCS, Smokin Tex, Solaire, Summerset, TEC, The Outdoor GreatRoom Company, Traeger, Vermont Castings, Vin De Flame, Vintage & Weber.